Guy Fieri heads out for some great places viewers asked him to visit. In Okarche, Okla., a family restaurant serving fried chicken the exact same way for more than 40 years, dozens of you wrote in about that one; a viewer's favorite in downtown Los Angeles, a Mexican joint doing 500 handmade tamales a day; and a favorite suggested by viewers in Houston, a deli in a strip mall making corned beef and kreplach like they do back in New York. 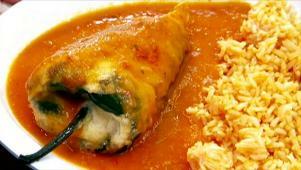 Here's a recipe for chile relleno, courtesy of Mom's Tamales, in L.A.